I look in the mirror and see a face different from the one I saw a few years ago. Yes, I have aged, put on weight and changed. But these are changes that can be seen and things people remark about. The changes that not so many people mention, at least to my face, are the changes in the way I interact with others and how opinionated I seem to have become. When an ex-colleague wished me yesterday and called me a ‘gentle’ wordsmith, I corrected him and said that I wasn’t so sure of the ‘gentle’ part. I was schooled to be gentle. Told not to raise my voice. And in the bargain, I somehow lost my ability to truly stand up for myself. Now the ‘gentle’ woman has given way to a much fiercer version of me – actually, the real version of me. Authenticity rules! At times I hear myself talking, and say, ‘Hey, when did you become so vocal?’ At other times, I have to tell myself to go easy and realize that silence is the best response to a particular situation or person. I’m balancing my relationships much better and that’s something to celebrate. I’ll admit, I’ve become more wary of people. I no longer take things and people at face value. From the trusting, open soul I used to be, I’m more cautious and guarded in some ways. A few people may find that I’ve become cynical, and perhaps I have, if cynical means that I no longer buy their stories or jump to rescue them from the messes of their own creation. Somewhere along the way I’ve realized that I am an introvert and it takes a lot of energy for me to interact with people, especially in large groups. That’s a huge realization, and it brought about a lot of change. In the past, I’d force myself to attend parties and make visits out of a sense of duty. Now I’m quite happy to skip several social occasions that sap my energy without feeling the slightest guilt. I’ve also learned to cut off or minimize contact with people who drain me or bring drama into my life or who are just plain mean or jealous. I read this today and it well articulates what I’ve been unconsciously doing: You need to align yourself with people who fit your destiny not your history. The biggest change I celebrate within myself is that I am no longer apologetic about my choices and my behaviour. Only I know how hard I’ve worked to bring change within myself, to become stronger, to make better choices. Another change that I celebrate is that I am now much more open to other people’s choices. For example, I have grown from thinking that homeosexuality is a sin, to being someone who will stand up for the freedom and rights of the LGBTQ community. Perhaps, the biggest cause of celebration for me is that I’ve learned to be grateful for my blessings and even for things that seemingly go wrong. I see everything that happens as a life lesson. Yes, I might grumble for a short while and then I realize everything works for good and that somewhere down the road I’ll figure out why that particular bump came my way! It’s the same with all of us. Only the individual knows the battles they’re fighting. Only you know how far you’ve come and where you want to go. Know that I wish you well on that journey. Have you changed over the years? 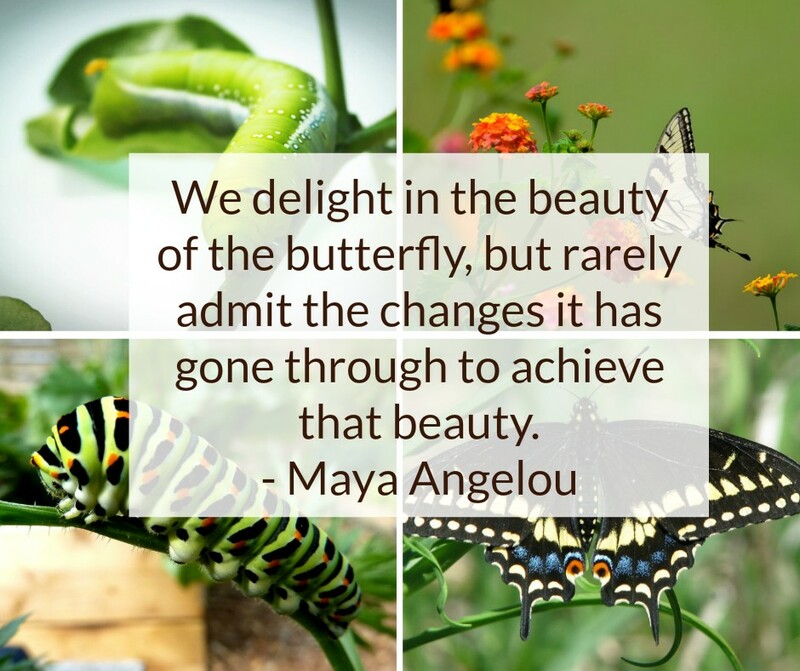 I’d love to hear about your metamorphosis. Oh goodness – Happy Birthday for yesterday – how did I miss it on FB?! Hope you had a lovely day. Yes, the changes we go through really seem to pick up pace after 50 don’t they? I notice it in myself and in my aging parents – for me, it takes a lot of willpower to accept it as the circle of life and not be sad about the changes. I do try though! You need to align yourself with people who fit your destiny not your history. Happy birthday again Corinne. Its good to see so many changes. Atleast you are still growing and adaptable to changes around you. I have noticed that since we are much wiser(!) now, we can now just cut the crap and get down to business without worrying to make others happy. So good to have met you in the blogging world. Perfect timing, Corinne. I can relate to this post. Loved it! Corinne, I love the part about staying away from negative people. That’s sometimes easier said than done, but a definite goal in my life. Thanks so much. Happy birthday again Corinne. We all change as we grow. And it is good, right? Some amount of cynicism in inevitable. I’d much rather call it loss of naivety. I’ve changed too of course – become more confident, a little less bothered about what people think of me. But I still have a long way to go to be the person I would like to. Yes.People change over time.It is a result of their experiences in life. Can relate to your post very well Corinne. I too had changed a lot through all these years. Learned to be brave and strong. Learned to deal things smartly. Became more outdoorsy and outspoken. What a lovely blog! And I could have writte this post myself. Through my 50s I’ve become this whole other person in many ways. I’m the cliched “reclusive novelist living on a mountain” and find people fascinating but sometimes exhausting. Drama: go away! Speak my mind: it’s either that or I zip my lips and walk away *laugh* I like my independence and strength. I have changed over the years. I have changed from that shy, quiet, fearful, low self-esteem, always assenting girl and a woman into this woman who no longer repents in her mind for anything. Neither for her need to be in quiet and solitude nor for staying away and not calling up even closest of relatives for their unmatchable capacity for drama, judgement and negativity. I am gentle in my ways and do not give my opinion on anything unless I know it is going to be valued and at the same time I wouldn’t do something I do not intend to do knowing how to decline and refuse. I am fearless and there are very little things which can create a ripple in my peace. Now I think I should have done a post on this because there is lot more to me. Majority of these changes have happened in the past year with my association with like minded bloggers and you Corinne. I can connect with your post, especially the “gentle” part! I have changed a lot over time, from being apologetic in trying to be myself…I am still a work in progress but yeah, I articulate my opinion and stay away from toxic people. Like you, I am also an introvert and there was a time I was trying to be someone else but not anymore. This post is pepping right now, Corinne. Time now, to celebrate who we are! Hey Corinne, Can I use the same prompt as yours in the link up as it seems interesting to me. We get a wider view from a certain height…and same is the case with our wisdom. While reading your post I felt as someone is speaking from my side…so relevant! Once again, happy b’day Corinne! A very happy birthday to you … and hope you had an amazing day. I was a very very gentle girl while growing up… I mean being an introvert didn’t help either… but as I grew I realized I can speak up … and strongly too. I like this new version of me. I am still somewhere between a ‘gentle’ and ‘strong’ phase but still an introvert when it comes to socializing. People find it hard to believe but they don’t realize how fear grips my heart when I have to meet new people 😀 Few more years and I will get over it too 🙂 As you said only individuals know the battle they are fighting. Happy Birthday, Corinne. What a fantastic way to celebrate it, by rejoicing in the changes you recognise as making you stronger and more authentic. Life teaches us the importance of being less gullible and relying more on our instinct than blind trust in others. We also become more protective of our time and energy and I think that’s a really good thing. Thank you for an inspirational post that is full of gratitude. I have changed over the years. I am more comfortable (at work and in private life) to speak up if I disagree with something. I celebrate being an introvert. I have an inlaw who has bullied me about being an introvert (I don’t think she will ever quite understand and I’m past trying to educate her) and, in the past year or two, I’ve (verbally) pushed back. Interesting how bullies react when they get pushback. I have less patience for family melodrama. After experiencing the death of my childhood best friend last year, I also have the attitude that “life is too short”. And, happy belated birthday to you! Happy Birthday and wishing you continued growth and acceptance in the woman you are now! I have eliminated the negative and drama people from my life and those I have to associate with on a very limited basis. I actually do not invite to my home anyone, family or friends who has bad energy. I meet in Starbucks or some other neutral location than my home, or my business! Happy Birthday once again, Corinne. 🙂 Wishing you all the best for this year and beyond! The greatest thing about ageing is that we become more and more comfortable with our true selves and aren’t afraid to make our opinions known. I think most of us do become more cynical as well, based on the number of bad experiences with other people. Life is too short to be a doormat, yes? Excellent points, here! Great post, and I love the quote. Beautiful post Corninne…..as one grows, one changes…..from a seed to a sprout to a plant…..there is much to learn along the way…..I liked the way you candidly confessed your misunderstanding of the LGBTQ community and the fact that you were able to overcome it…..
We seem to share many personality traits and even their evolution. I still need to stand up for my opinion more in even little ways. It irritates me when I don’t and then some project goes sideways because I didn’t demand what I felt certain would have been a better course of action. Oh, well. I’m a work in progress. Be well! when we can look in the mirror as midlife women and like what we see? It’s a great thing. It’s a successful life. Hope this year is the best for you! It is, Carol. Thank you! It’s always good to know that someone else has travelled along a similar route and understands where I’m coming from, Rica. Thanks for sharing.